S Giridharan is the founder-chairman and chief executive officer of EdServ, the fourth generation education services company that went public in early 2009. The Bombay Stock Exchange-and the National Stock Exchange-listed, Chennai-headquartered EdServ ended FY10 with revenues of Rs 52 crore (Rs 520 million) and is targeting revenues of Rs 150 crore (Rs 1.50 billion) this year. In an interview with Rediff.com, Giridharan speaks about how he became an entrepreneur and chose the field of education to work in. Did you always want to be an entrepreneur? Are you from a family of entrepreneurs? I am not from a family of entrepreneurs but, basically, I am a creative person, willing to explore, with a sense of providing service. My father was an engineer with the electricity board. My family believed that getting educated was first and foremost, rather than being an entrepreneur. That meant one was not allowed to explore, try innovative things. One had to only go through the proven path. 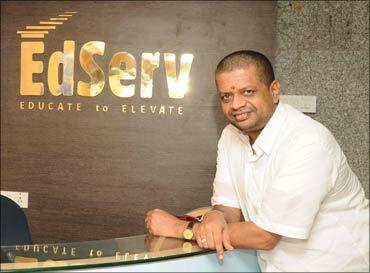 Image: S Giridharan, founder-chairman and chief executive officer, EdServ. You went to the United States while working for HCL. Did your stint in the US and meeting entrepreneurs there give you the courage to start something of your own? I went to the US in the late 1980s. That gave me an opportunity to see how professionally managed companies provide better results. It also taught me how to be quality conscious and consistent in doing things. I also understood by deploying more technology, you can achieve more. Then Kalpathi Suresh, who also worked with me in HCL, came back to India and created SSI along with his brothers in 1991. I joined the company in 1992. I did not invest in SSI. 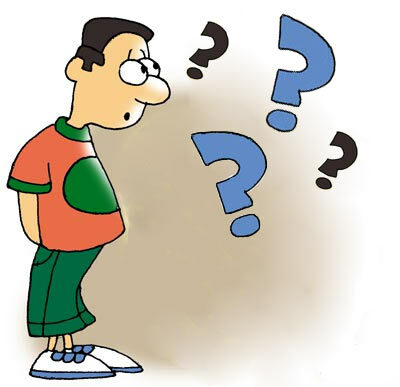 It was a big decision for me as SSI was a very small entity with only about 10 people and it was only a year old. That was one thing that helped me fuel my idea of being innovative and creating something that is worthwhile. SSI was created for the common man and I found the idea attractive. What did attract you about working in the field of education? Education was one area I found interesting to work in. I found that training and teaching what you know can change lives forever. 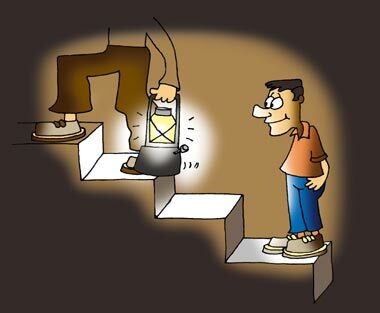 The formal education system was not providing opportunities at that time for an entrepreneur. Formal education was also not supplementing career requirements. When did you become an entrepreneur? I quit SSI and founded Radiant Software in 1997 with a capital of about Rs 4-5 lakh (Rs 450,000-500,000) to set up the first centre. With venture funds, the company grew to about 75 centres and later to 120 centres in about 3 years. We were spread all over India and also in Sri Lanka and Malaysia. In 2007, the education model was changing to formal education support mode and the technology-led thinking started looking at emerging trends of education focusing on e-Learning which has been there for the last 10 years all around the world. The Web has always been seen as free. I wanted to change that and tweaked the 'free web' model. It was then that we decided to have this paradigm shift and EdServ chose to focus on the emerging education which is more into e-Learning. From where did the funds come? We got this funded by Kalpathi Suresh (with whom I had worked 15 years ago at SSI) who had since started a VC firm called Kalpathi Investments. They invested about $1 million. What was the business plan? We created a product called LAMPS (Learning Assessment Placement Management System) and started buying some content from content providers who could not take their content to market. We provided IT training and also e-learning contents were available for engineering students to help them pass the exams. With the Web, we brought in consistency, a cost-reduced offering, more proximity dependent but not free. We were the first one to bring in this model on the web in the education space. When and why did you go public? We were planning to grow all over India and provide more solutions to students. So, we went in for an IPO (initial public offering) in March 2009 and raised about Rs 23 crore (Rs 230 million) and got listed on the BSE and the NSE. EdServ became a next generation education product offering students a lot of varied content. LAMPS became Lampsglow.com incorporating multi level student learning systems and we also moved the job placement solutions on to the web. Now EdServ offers total end to end education solutions right from the cradle to career placement. 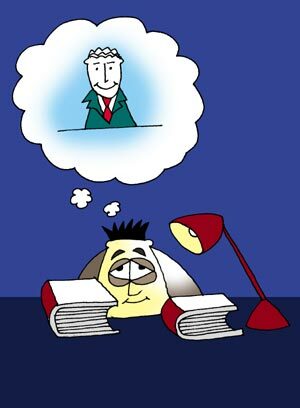 We offer examination support for engineering students, provide e-learning solutions, on line tutoring. Subjects are not a barrier any more. How do you evaluate the education market in India? It is huge. The government is yet to spend on education. The budget for education is close to Rs 40,000 crore (Rs 400 billion), next only to defence. We have a division that provides vocational training to the downtrodden and the under-served sections of the society. The government provides this training free to the downtrodden and we get reimbursed by the government. We have so far trained about 100,000 students. It is an offline manual training based on government regulation. Emerging e-learning space is a big market. Formal education is another space. After the Right to Education Act, the government outlay is for Rs 1.8 lakh crore (Rs 1.8 trillion). Over 20 crore (200 million) children are there in primary school, while only 2 crore (20 million) are in higher end education (beyond the 12th class). The challenge is to increase the retention and then increase the admissions to higher end education. What is not happening is an opportunity and what is happening is also an opportunity for us. What is happening is where you need to compete with other players and get business. What is not happening, but where there is a requirement, is an opportunity where you can create, innovate and provide and thus become the first mover in the industry. 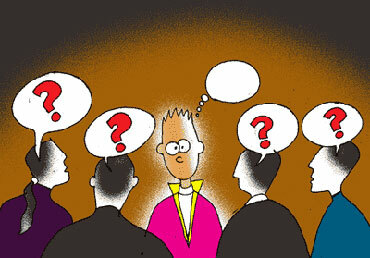 What is the Public Private Partnership model that you are doing for the Gujarat government? Our relationship with the Gujarat government is part of our focus on our plans to engage with governments. The idea is to provide vocational training. The first step in Gujarat is to set up three skill upgradation centres (SUCs) in Kheralu in Mehsana district, Gondal and Aji in Rajkot. 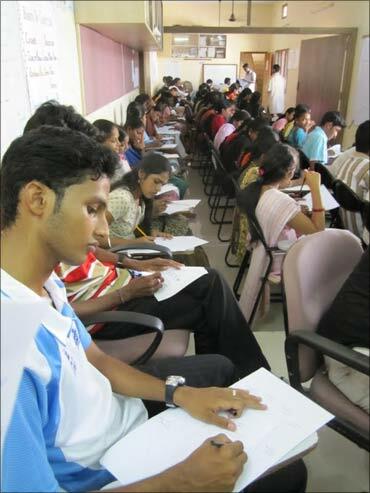 The Gujarat government provides the infrastructure and we do the training. This is about providing training to drop outs at a later age to fit them into the nearest job of their choice and interest. This will help them become financially independent. We have trained 100,000 students on Vocational Training Programme under the Ministry of HRD and Labour. The typical duration of the courses range from 2 to 6months, depending on the number of hours, which range from 120 hours to 700 hours. The government has 40 different domains, including ICT training, tailoring, khadi craft, jewellery-making, garments and agriculture. As far as Gujarat is concerned, our plan is to get 25 SUCs and may be ITIs (Industrial Training Institutes) as well. Since we have an online job engine, we assist those trained with job placement. We feed their profiles into our job engine and these details also go to the prospective employers. This speeds up the connectivity between the employer and those trained by us. Image: Students at a classroom. Was it difficult to enter schools with your programmes? Not exactly. Through SchoolMATE ERP that we acquired, we straightaway got access to over 70 schools. There are over 22,000 private schools in TN and AP alone. To start with, we work in 150 schools in these two states. We plan to be there in 500 schools in the next one to one a half years. Through Vidhyadhana Academy, we will be investing up to Rs 40 lakh (Rs 4 million) in each school for infrastructure development and multimedia content. What are your financial growth targets? We ended last year with revenues of Rs 52 crore (Rs 520 million). This year, our target is to achieve revenues of Rs 150 crore (Rs 1.50 billion) with an EPS (earning per share) of Rs 30. 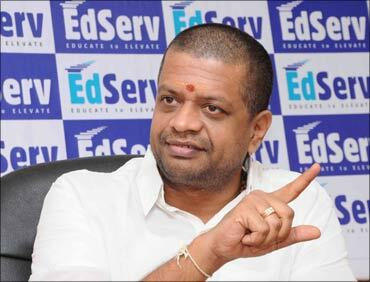 Image: S Giridharan, founder, EdServ.